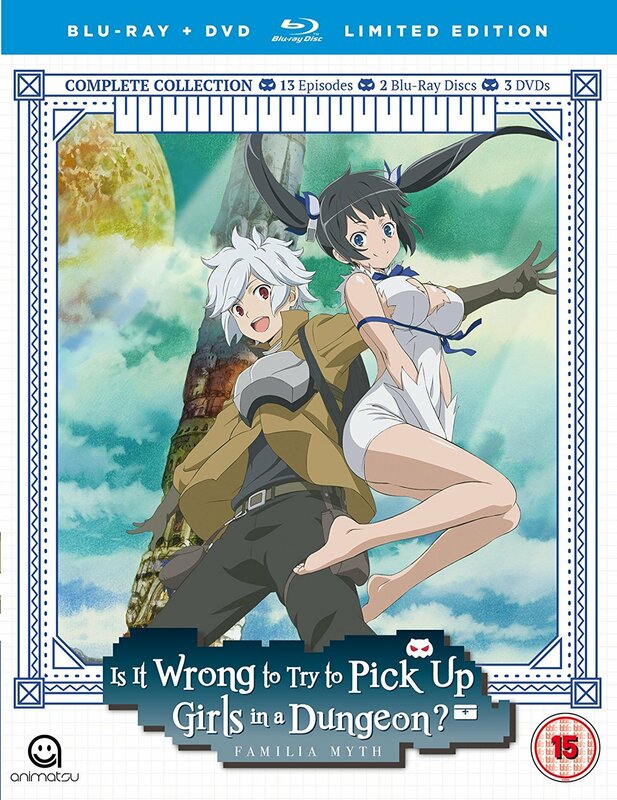 If you were to ask me what my favourite light novel is, I’d name a volume of Is It Wrong to Try to Pick Up Girls In a Dungeon? (or DanMachi, as it’s often shortened to in Japan). It’s a fantasy adventure series that stole my heart, so I’m sure it’ll come as no surprise that I’m reviewing the anime home video release for AnimeUKNews. As a general note, this review contains a few spoilers but I’ve kept them to a minimum. It’s also worth noting that although the subtitles used by Sentai Filmworks refer to the character Aiz as ‘Ais’, I will be keeping the original spelling, as it’s in keeping with the official light novel and manga translations (as well as the subtitles Crunchyroll used when the show was simulcast). Now, onwards to the review! Our story is centered around Bell Cranel, a 14-year-old boy with dreams of being a hero. He lives in the city of Orario, which sits atop a mysterious dungeon and is home to many types of citizens – some of them are known as ‘Adventurers’. Adventurers make a living by exploring this dungeon and battling the monsters inside, who drop magic stones that can then be sold for money. In Orario there are many gods and goddesses who came down to Earth and established Familia, which people could then join up with. The role of each Familia differs depending on the god or goddess in charge. Bell belongs to the recently formed Hestia Familia and is the only member, but being in such a small Familia has given him the benefit of becoming close to his goddess, Hestia. Due to this closeness, the two have come to consider one another as family. . Being a rookie adventurer, Bell one day finds himself in danger while exploring the dungeon. He’s saved by the legendary ‘Sword Princess’ Aiz Wallenstein, but due to his somewhat pathetic display, other adventurers make fun of him for it. Frustrated by his own weakness, our hero vows to become stronger – strong enough to protect those close to him and to one day be able to stand beside Aiz as an equal. This is a tale of what you can achieve if your dreams and desires are strong enough. Every adventure is broken down by level and stats, like those you’d find in a video game. In the beginning Bell is level 1 and has no skills or abilities to speak of, but not long after being saved by Aiz, he awakens the ‘Realis Phrase’ ability, which allows him to grow stronger based on the strength and conviction of his feelings. It might sound as if Bell has the potential to be an overpowered, generic protagonist, but that’s not actually true. Our hero does power up quite quickly but almost everything he obtains is through proper hard work and dedication. It’s a refreshing thing to see when so many other fantasy protagonists can be crazily powerful, with godlike abilities. Bell is quite bland on the surface but underneath his somewhat generic exterior is a funny, kind, quirky character that I instantly found myself rooting for. While I love the setting of DanMachi, I think the characters are what really makes it. Hestia Familia might be small but Bell is soon joined by a supporter known as Lilly and a craftsman called Welf. Both of these characters and the goddess Hestia have interesting personalities and stories to tell, but I shan’t spoil them. Even if we move away from Hestia Familia, the world of Orario is filled with a great number of fun characters – especially those in Loki Familia. 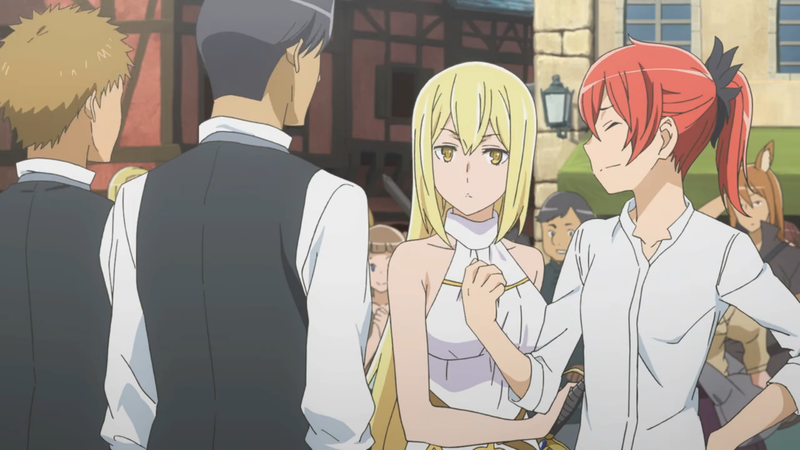 If you’re familiar with the DanMachi series then you’ll know that there is a spin-off known as Sword Oratoria, which is centered around Aiz and Loki Familia. 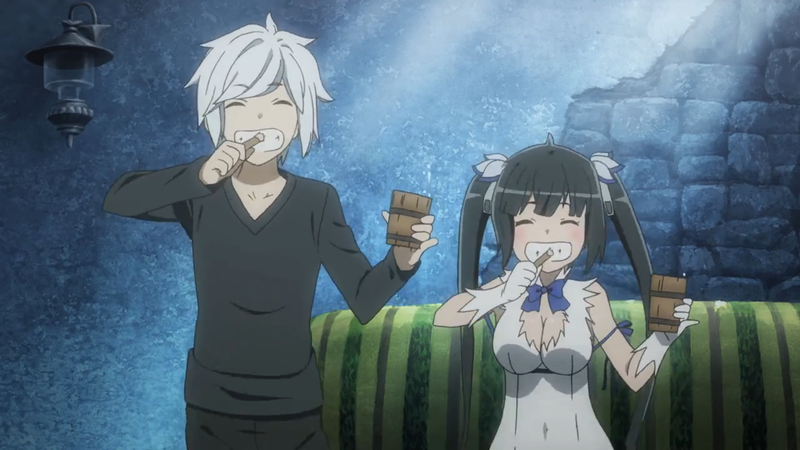 Seeing these cast members in the main DanMachi series is a joy because Loki Familia is made up of some very unique characters, such as Bete and Finn. One of the wonderful things about this series is that it’s a great watch for both newcomers and veteran DanMachi fans alike. For newcomers, the anime team really excelled at putting the story together, removing certain sections from the novels that weren’t as relevant, and finding a solid stopping point. The show feels complete, even if you are left with the feeling of wanting more. However, for existing fans of the series, there is a lot to be said for the joy of seeing familiar faces and picking up on references that otherwise might have been overlooked. This is my second time watching the anime (I’ve also read all of the light novels translated into English so far) and I still found myself completely engrossed in the series. Animation for the series has been handled by J.C Staff and I have to say it’s very well done. The entire anime is very colourful and full of life, but where the animation really shines is during the battle scenes. 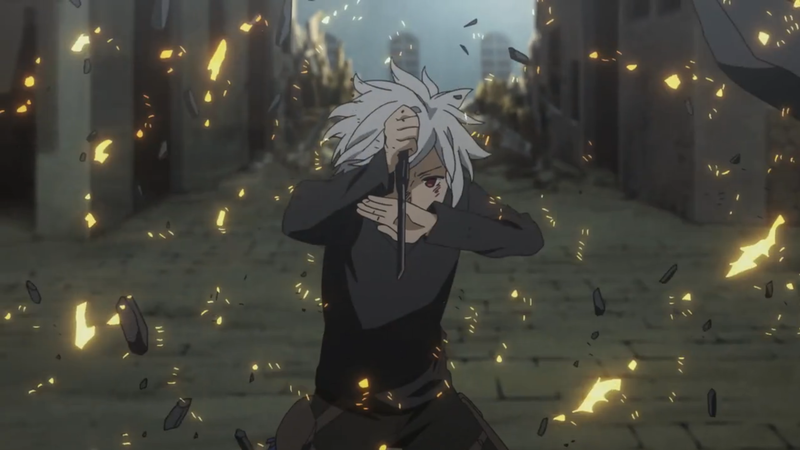 DanMachi has some incredibly detailed, well-directed shots that draw you in and makes it feel as if you’re experiencing these battles first-hand. Speaking of battle scenes, these are greatly enhanced by the soundtrack by Keiji Inai, who also worked on Outbreak Company, Heavy Object, and Btooom!. Inai has experience composing music for video games and that shines through in his work for DanMachi. All of his scores sound suitably fantastical and work wonders to ramp up the tension for the life-or-death action scenes. In some ways, I honestly believe it’s better than the music for Sword Art Online, which is composed by the incredible Yuki Kajiura and is a soundtrack that I also love. The opening theme is “Hey World” by Yuka Iguchi, and is a cute track but doesn’t really fit the whole grand adventure sense that DanMachi goes for. The ending is “RISE” by Kanon Wakeshima and in contrast to the opening, it does fit the show fairly well and is overall a much better song. The voice actors for DanMachi all do a very good job. Bell is voiced by Yoshitsugu Matsuoka (Kirito in Sword Art Online, Sorata Kanda in Pet Girl of Sakurasou and Soma Yukihira in Food Wars! ), who is a personal favourite of mine and always seems well suited to hero protagonists. He injects a lot of personality and emotion into Bell, which was always a pleasure to hear. Having said that, I am also very attached to Yurika Kubo (Mayu Takasaki in The Pet Girl of Sakurasou, Cha-Komon in Amanchu! ), who played Loki and always managed to pull off the goddess’s cheeky quips well. There is an English dub included with this series but Bryson Baugus, who plays Bell, does not fit the character and brings the whole show down. It’s not a terrible dub but it’s certainly not one I could listen to when Matsuoka does such a great job in the lead role in Japanese. This release is brought to the UK thanks to Animatsu in a collector’s edition, which includes all 13 episodes on both Blu-ray and DVD, and includes a poster. The only on-disc extras are clean opening and ending themes. The only complaint that I have with the release is the subtitles changing the spelling of Aiz, but this seems to be a quirk of Sentai Filmworks as they’ve also changed the spelling of her name for their releases of Sword Oratoria. This deluxe edition was also meant to include some art cards, but a week before release all mention of them was removed from online listings and an unboxing confirmed that they are no longer included in the set. 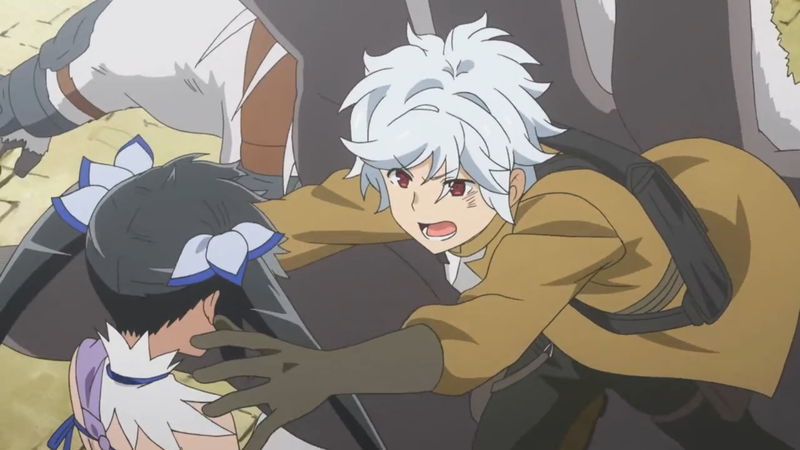 Overall DanMachi is a fantastic fantasy adventure with a lot of heart. The varied and intriguing cast bring the world to life, while the soundtrack and animation offer us some of the best fight scenes I’ve had the joy of watching in quite some time. I highly recommend that everyone gives this show a shot. Sword Oratoria offers everything we’ve come to know and love about DanMachi. Fans of Aiz and Loki Familia’s crew will get a lot out of this release, as will those who’re just looking for another DanMachi fix. Beyond the Boundary the TV series is already a mixed bag, but the films feel even less good than that.